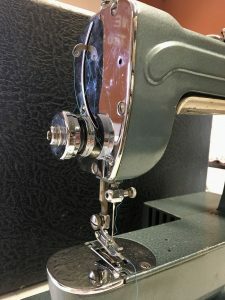 We meet regularly at The Sewing Machine Project to look over and prepare machines that have been donated to us–machines that are en route to their next home. Many cases are familiar, even before opening. I often look and think “oh, I know what you are!” before I even click open the latch. 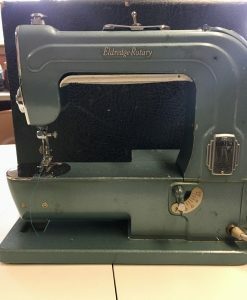 And I have to say, each and every member of our “Machinist’s Union” are professed sewing machine geeks. We delight over interesting machines of all ages, and new challenges–in threading, in operation, in cleaning them up to prepare for their next step. The antique machines are especially intriguing. Occasionally, there’s a case that’s a mystery. That’s what happened a couple of weeks ago. The carrying case itself was quite old, squared off at the corners, a mottled black and grey. We hoisted it up on the work table and peered inside. Like opening a treasure chest, what awaited us made us all smile. A little old curvy machine, blue green like the sea on a cloudy day. Clearly labeled “Eldredge”. Now we haven’t tested her out yet but all signs point to Eldredge being a sweetie of a machine. Curious, one of the MU members googled the model. 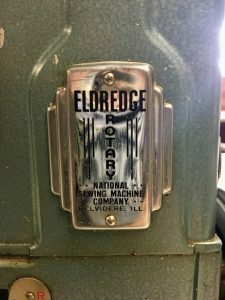 Barnabas Eldredge created his first sewing machine shortly after the Civil War and after manufacturing on the east coast for awhile, he moved his operation to Belvedere, Illinois towards the end of the 19th century. Several company shifts over the years led him first from partnering with June manufacturing to becoming National sewing machine and eventually Janome. You can read more here. One tidbit I found interesting was that there was no ageism in the National Sewing Machine company. They offered jobs for life. So welcome, Eldredge! I’m not sure where you’ll end up but thank you for the beautiful new story you’ve introduced! What a super beauty….and looks like she’s a workhorse besides. The perfect combo. How wonderful to be reminded of the integrity and talent of the machine designers in the olden days. A gem!